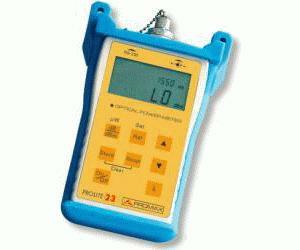 The PROLITE-23 optical power meters are compact, lightweight and easy-to-use instruments for optical fibre network, with unique characteristics of quick testing. Widely favored for their quality, value, reliability, accuracy and safety, the pocketsize PROLITE-23 can support accurate testing of single mode and multimode optical fibre systems, with features of large LCD display, damp and shock proof design and dual-way powering system. The internal microprocessor and lineal amplifier technology ensure the long-time accuracy. Besides, PROLITE-23 has a large memory capacity of 3200 records and can transfer the measurement data to a PC for editing and printing.